I’ll be teaching a new course, based on Mac interactive tech and featuring Apple’s free developer tool Quartz Composer, at the new 3rd Ward space in Brooklyn (East Williamsburg aka Bushwick). 3rd Ward is an enormous “workspace and studio facility for artists & creative professionals”: think the artist equivalent of a gym membership plus enormous studio and fabrication space of a scale we rarely see in New York. The idea of the course is to offer artists a solid grounding in interactive design and responsive visuals and projection, even for those who have no previous experience. My belief is that artists from traditional media often get denied the opportunity to experiment with new technologies, leaving them instead for the “digital people.” So, I’ve also chosen to teach free tools, which make for an easier investment, and also don’t require you to make a commitment early on to a single tool that might not be best for you. You can also expect lots of hands-on experimentation with visuals, video, projectors, sensors, and sound inputs, because that’s the kinda person I am and 3rd Ward actually has space! If you or anyone you know in the New York area is thinking of registering, feel free to get in touch. 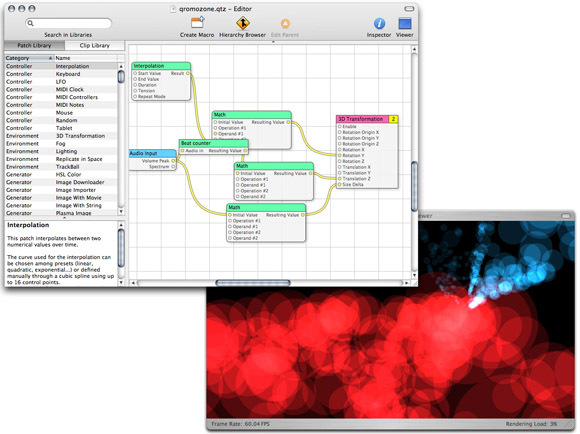 But don’t fret if not: I want to give something back to the awesome Quartz Composer and Mac community, so I’ll be posting examples and class notes here on Create Digital Motion to share with everyone and get feedback.